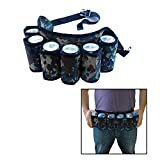 Hold up to 6 beverages with adjustable belt to fit waist in any size. Made of durable nylon fabric for longer lasting use.Perfect in occasions like party, fishing, camping, beach, tailgating, hiking or any event where drinking is present, you will never feel dehydrated again. Perfect in occasions like party, fishing, camping, beach, tailgating, hiking or any event where drinking is present, you will never feel dehydrated again. Great gift for any redneck people you know or maybe your friends office mates and surely they will love this amazing belt.